This bike test is from the December 2006 issue of MXA. 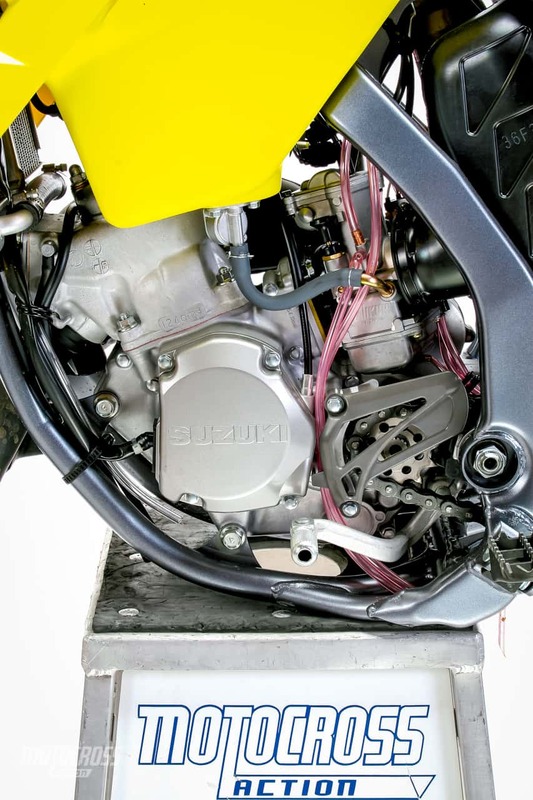 It is easy to look at the 2007 Suzuki RM125 and see a throwback to an ancient era. You don’t have to be an archeologist to catalog the relics: steel frame, revvy powerband and unchanged exterior. The RM125 is getting long in the tooth when compared to the Yamaha and KTM. Yamaha went all-out on a totally new bike in 2005, and KTM threw the complete chassis away and started over in 2007. Perhaps from a business point of view, it doesn’t make sense to invest valuable R&D money into 125cc two-strokes anymore, especially when the market has gone goo-goo over four-strokes. And Suzuki obviously had bigger fish to fry with the release of its all-new, Suzuki-built, aluminum-framed RM-Z250 this year. That makes the RM125 a lame duck—even though it’s not a politician. Faced with shifting market trends, decreasing two-stroke sales and better uses for its R&D money, the 2007 Suzuki RM125 is destined to face the world with nary a mod. Is doing nothing enough to save the RM125? The MXA wrecking crew decided to find out. 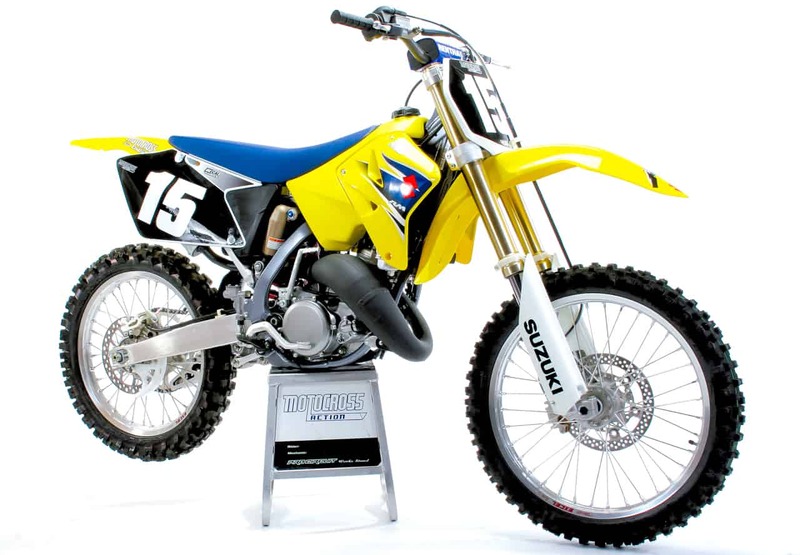 Q: DID SUZUKI MAKE ANY CHANGES TO THE 2007 RM125? A: Yes, but you aren’t going to have to hold onto your hat when you hear the list. (1) Seat cover: For 2007, the seat cover has a textured pattern on it to improve grip. (2) Graphics: Normally we wouldn’t mention that the tank decals are different for ‘07, but the list of changes is so small that we feel the need to pad it. (3) Fork guards: The front fork guards are lighter than in ‘06. Q: WHAT DO THESE MODS MEAN ON THE TRACK? A: Nada. But last year Suzuki gave the RM125 some love with a stronger piston ring knock pin, narrower reed valve passage, new exhaust pipe, hopped up CDI map, Renthal FatBars and stiffer suspension settings. As for the ‘07 mods, if you can figure out how to go faster by virtue of gripper side panels on the seat, you are on to something. The 2007 Suzuki RM125 only received small changes since the bike was on its way out. 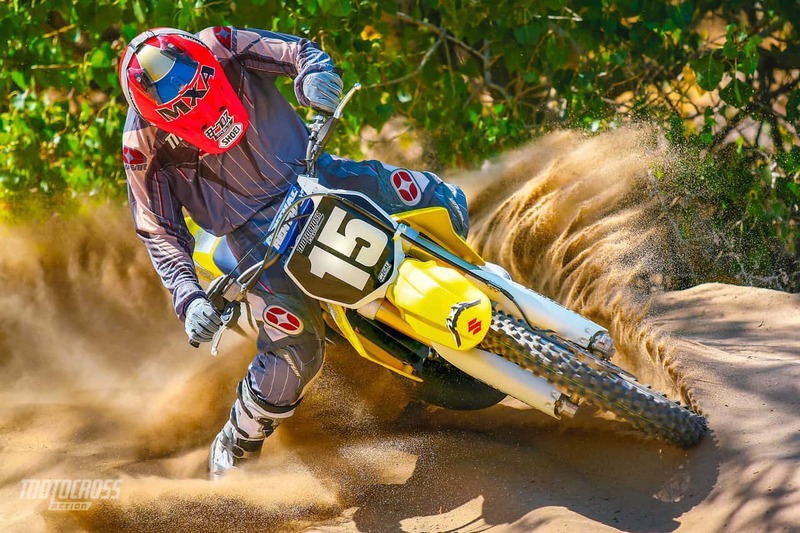 Q: IS THE 2007 RM125 FASTER THAN THE 2006 MODEL? Q: HOW DOES THE 2007 SUZUKI RM125 RUN? A: The engine does its best work from the midrange on up. Although the low-end has been improved considerably over the years (thanks to the 2006 cylinder changes), this isn’t a torque-monster. RM125 riders will have their best luck holding this bad boy wide open, fanning the clutch and listening to the engine sing. You’ll be living on the edge, but sometimes that’s the only thing that makes life worthwhile. Is the 2007 RM125 engine competitive? Yes, but just barely. It is at its best as an entry-level 125cc machine for young riders making the jump up from the mini ranks or for someone in the market for a fun bike that will be cheap to maintain. Q: WHAT IS THE WEAK LINK OF THE RM125 POWERBAND? A: It doesn’t like a load. On flat, hard ground the RM125 is as fast as any other 125, but throw in a hill, soft sand or deep loam, and it struggles. The engine does its best work from the midrange on up. Although the low-end has been improved considerably over the years. Q: WHAT IS THE CHEAPEST WAY TO IMPROVE THE 2007 RM125 POWERBAND? A: Gearing. Depending on your local track layout, the RM125’s gear combos can be configured to give you drive for tight tracks or rev for long tracks. We think every Junior level rider should gear it down one tooth. Q: WHO MAKES THE BEST SUZUKI RM125 PIPE? A: Go with FMF. Their pipe doesn’t waste any time trying to make the RM125 into something that it isn’t—it gives the RM more where it already has the most. With more mid-and-up, the RM125 can hang longer in each gear. Call FMF at (310) 631-4363. Q: MOTO TASSINARI OR BOYESEN RAD VALVE? A: MXA’s RM125 test pilots prefer the Moto Tassinari reed. This is a worthwhile mod that makes a noticeable difference in the meat of the powerband. On flat, hard ground the RM125 is as fast as any other 125, but throw in a hill, soft sand or deep loam, and it struggles. Q: HOW MANY GEARS DOES THE 2007 RM125 HAVE? A: It’s a sixer! Good thing, too. 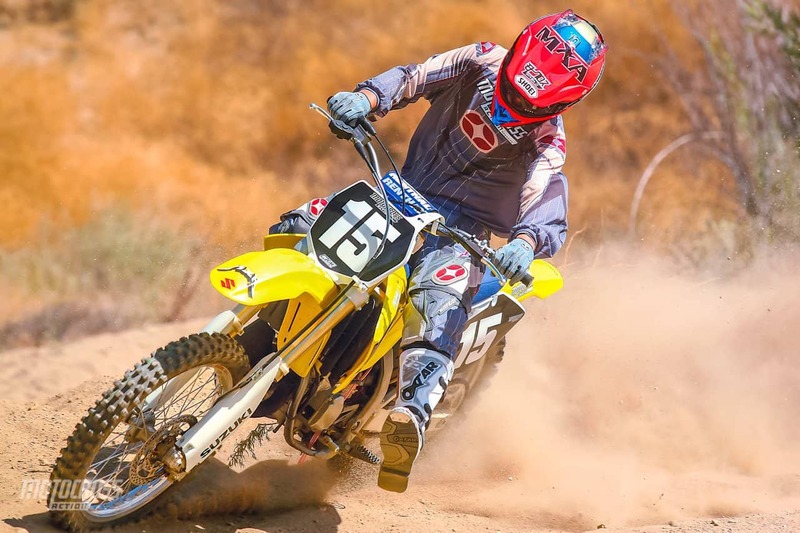 Suzuki’s power output isn’t really potent enough to pull widely spaced gears, so the close-ratio six-speed magnifies the power and places it at the rider’s left foot. Stir the lever or go slow. Q: HOW GOOD IS THE SHOWA SUSPENSION? A: MXA test riders used to dread riding the RM125. The suspension settings were so soft that with a fast rider onboard it bucked like a Model T on a washboard road. 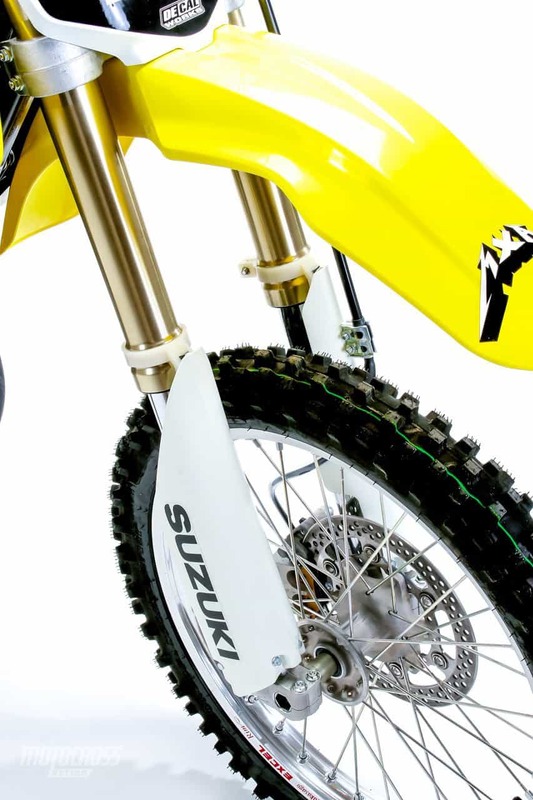 Thankfully, back in 2006, Suzuki got on the stick and added some damping versatility for a wider range of riders—not just minicycle refugees. Stiffening the valving on the forks and adding a stiffer shock spring were good things for the average-sized 125 rider. And, if you are a mini munchkin, all you have to do is turn the compression clickers out on the forks and shock to get it more supple. Q: WHAT WAS OUR BEST FORK SETTING? A: Even though the fork valving is stouter, most MXA test riders still wanted to go up on the spring rates. We swapped the stock 0.42 kg/mm spring for stiffer 0.43s. This is a must-do mod for fast racers, as well as heavier riders. The stiffer springs make the forks ride higher in their stroke and just give the bike a more balanced feel. To complement the stiffer fork springs, we chose to set the compression and rebound clickers at ten out. Q: WHAT ABOUT THE REAR SUSPENSION? A: Thanks to the stiffer spring, which was added last year, the rear of the RM125 is twice as good as it was back in 2005. The 2007 shock, valving and spring are unchanged from ’06. The rear suspension is fairly decent on the RM125, but you need to pay attention to the compression clickers. Q: WHAT WAS OUR BEST SHOCK SETTING? Even though the fork valving is stouter, most MXA test riders still wanted to go up on the spring rates. We swapped the stock 0.42 kg/mm spring for stiffer 0.43s. Q: HOW DOES THE RM125 HANDLE? A: The 2007 RM125’s chassis exhibits some really great traits. It corners like a scared rabbit and it flies like a bird. The RM125 is the epitome of agility, quickness and poise. It’s a little busy at speed, but it feels so light and well balanced that the little wiggle in the whoops is easily controlled. Thanks to its flat-out powerband and nimble chassis, the RM125 lends itself to total commitment. It has to have cat-like reflexes to run with the man-eaters that are after the herd. It doesn’t have the kind of power to pull a 250F out of the corner, so an RM125 rider must hone his later braking, wide-open, kamikaze approach to corners. (1) Power. This isn’t our first pick as a powerhouse 125. Although better than the anemic Honda CR125 mill, it plays third fiddle to the stronger YZ125 and KTM engines (and doesn’t come close to any 250 four-strokes). Where does it rank on the hierarchy of power? If we were to throw all the 250Fs into the 125 mix, the RM125 would be eighth on the list. (2) Gearing. 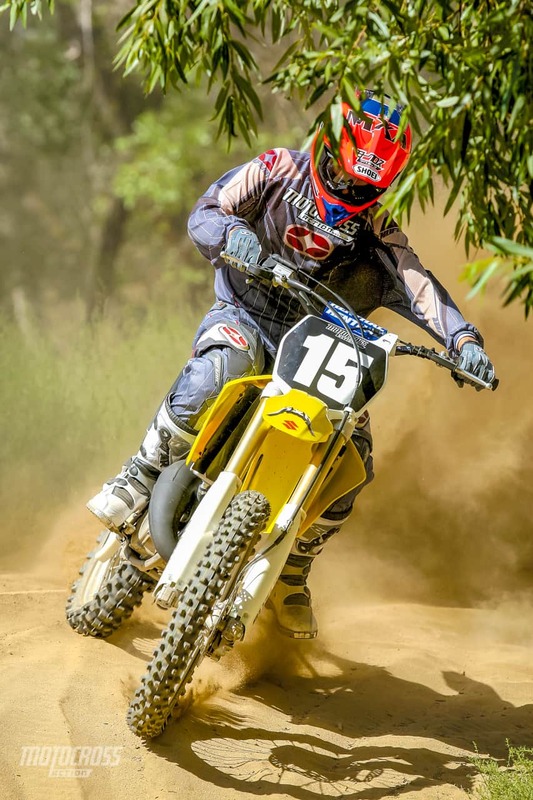 The RM125 needs help for tight tracks, deep loam or tracks with hills. (3) Clutch. This bike needs stiffer clutch springs. (1) Handlebars. Oversized Renthal Fatbars are a nice touch. (2) Feel. Although not the lightest 125 made, the RM125 feels like a feather on the track. (3) Brakes. Suzuki has dialed the brakes in. A great front brake. A: Let’s sugar-coat the 2007 Suzuki RM125 for a moment. It has traits, sensations and characteristics that don’t exist in this crazy mixed-up four-stroke world we live in. It is a fun bike to ride, cheap to maintain and not the least bit intimidating. But, underneath the sugar-coating is a bike that hasn’t been at the top of the 125cc two-stroke world since 1995—and four-strokes have changed the landscape drastically since then. It is a good buy for someone looking for a low-cost race bike that is yellow.